•	Installation of interface between fire alarm, emergency lighting, and secondary means of escape. K H Engineering Services Limited worked in conjunction with Bam Nuttall coordinating initial site investigations and the removal / relocation of services within the subway adjacent the proposed entrance to Platform 0. A programme of both normal working hours and engineering working hours were agreed as part of the contract, with a final key date of operation set for the 2nd of January 2018 as approved between all parties. During the course of the contract it become apparent the existing DNO service to the station was insufficient for the additional supply. This information was passed to the client and preliminary designs were completed, however, due to late client approval only 3 months were given to supply a new 400Amp service for the station. To meet this key requirement an additional labour team was drafted into the project and the programme altered to reflect the changes with the need to meet the key date unchanged. 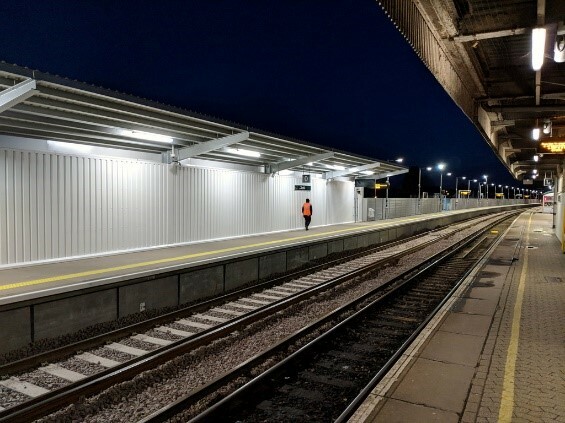 In addition to the extra works, further programme changes had to be completed due to the late completion by 3rd party contractors on key building structures within Platform 0. This included the canopy structure, waiting room and toilet block all failing to meet the key dates. Due to the above K H Engineering Services Limited made further amendments to the programme and devised a solution of a further team working night shifts in order to regain the lost time. K H Engineering Services Limited were the responsible contractors for this project and construction responsibility. KHESL were able to complete the project in line with the completion date with no RIDDORS and extensive improvement opportunities presented to the client. KHESL were delighted to report zero defects at practical completion with the final account pre- agreed.